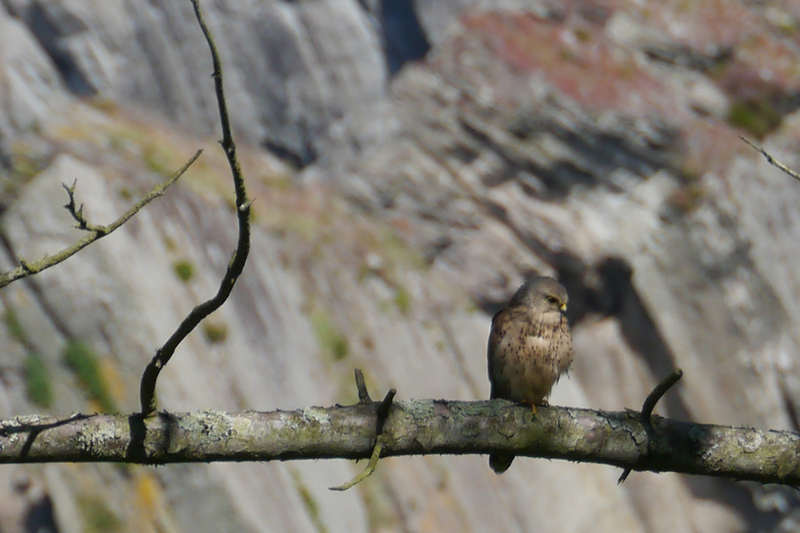 This photo shows the fledgling peregrine I spoke of yesterday. Taken by Betsy Bee, this photo shows our young pretender sitting in one of the Monterey Pines which stand guard over the cliffs at Damage. A rare treat. If one believed in such things as portents then my day began with a strong one. Rounding the corner by the Old Mill into the early morning calm of the bay, a young peregrine falcon was perched on the sea wall surveying the horizon. For ten stretched seconds I sat and watched, too fearful to reach for my camera, before he flew off across the water. 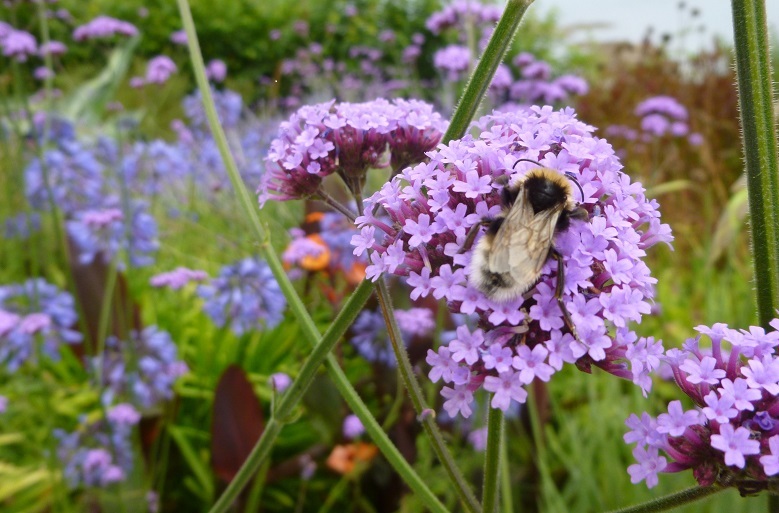 Wildlife featured highly in our garden day; bees of all denominations, hoverflies, butterflies, slow worms, woodpeckers and of course the juvenile robin. All this was enhanced by a boisterous troupe of brummies, humans who were fun, appreciative and paid, our favourite type of visitor! It is time to unveil the photo that has been kept in reserve for when circumstance, both unforeseen and otherwise, means there are no words to share. Normally my camera is pointed at plants, flowers mainly. I have been known to have the odd fungal excursion and if they stand still long enough some bugs and birds are always nice. This week I have taken (rather modestly) some rather nice photos of an assortment of humanlife in the garden. Bosswoman, Hero and Superbaz were all snapped and the results were in my opinion full of character, demonstrating the wonderful team and showing the fun we have in the garden. However none of the above celebs wanted their photos on my blog. The only reason I can attribute to this blanket reticence is that in my innocence I had not realised they are in fact an international gang of diamond thieves hiding out in one of the most inaccessible places in the planet, and then up a steep hill. So far they have avoided the clutches of Interpol. As my blog is a “go to” site for undercover agents they would obviously blow their cover and it might get a bit messy. 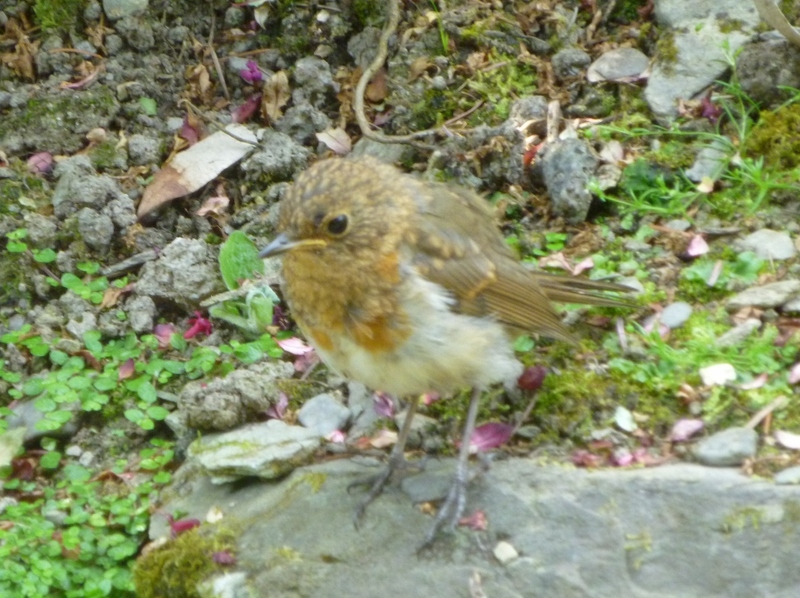 Admittedly I haven’t asked the permission of this baby robin who was shadowing me earlier today, he may well have been wired but don’t worry I said nothing. The day has been fraught with broken computers, unresponsive mobiles and an off/barely on internet connection. To some this might sound like heaven and I will embrace the enforced radio silence. 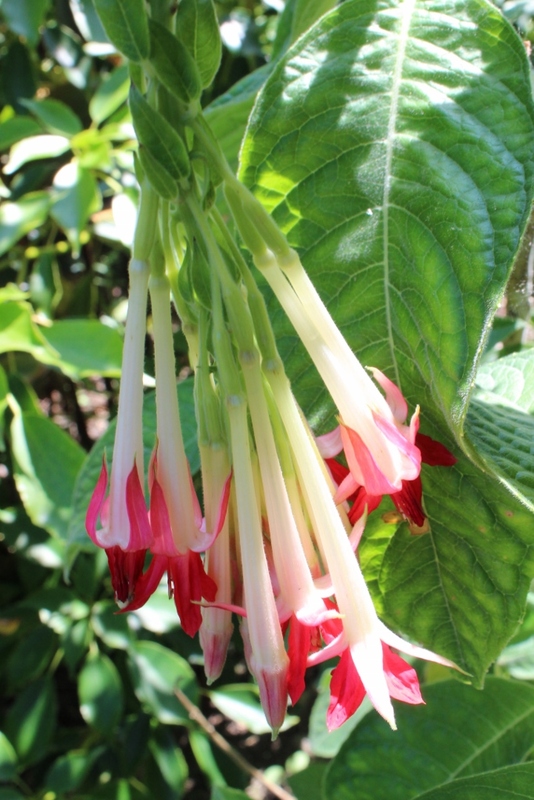 Luckily this photo of Fuchsia boliviana “Alba” speaks for itself. Tagged as Fuchsia boliviana "Alba"
Things were more settled in the garden today, well I was anyway. Reconnecting. The relentless heat continued, the feriosity of which is bound to make our truly tropical friends sigh or giggle or scream “you ain’t seen nothing mate!”. We were blessed by a cool breeze coming off the sea which brought with it squeals of joy from a posse of kayakers and respite from the horseflies. A visit from Rambling Ron brought refreshment of the inspirational kind, he planted a few seeds and watered some others. 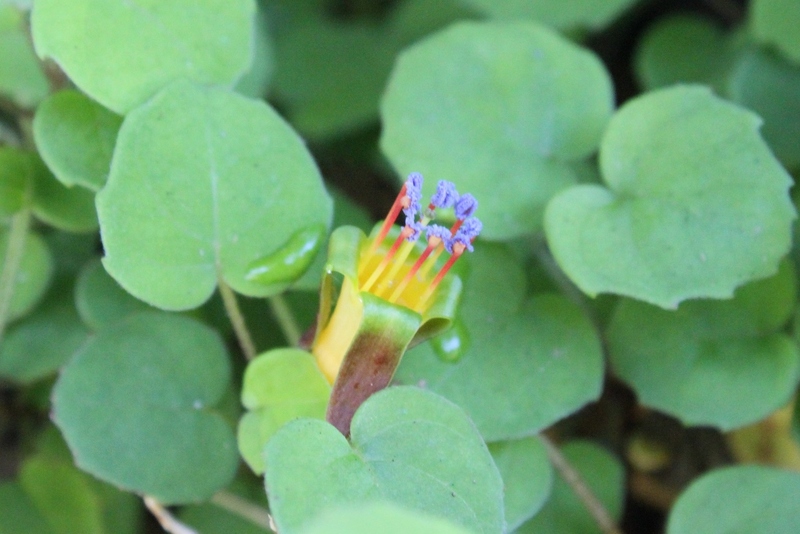 The blue pollen on this diminutive Fuchsia procumbens is the icing on the cake of this psychedelic flower poking its head up above the lily pad leaves. 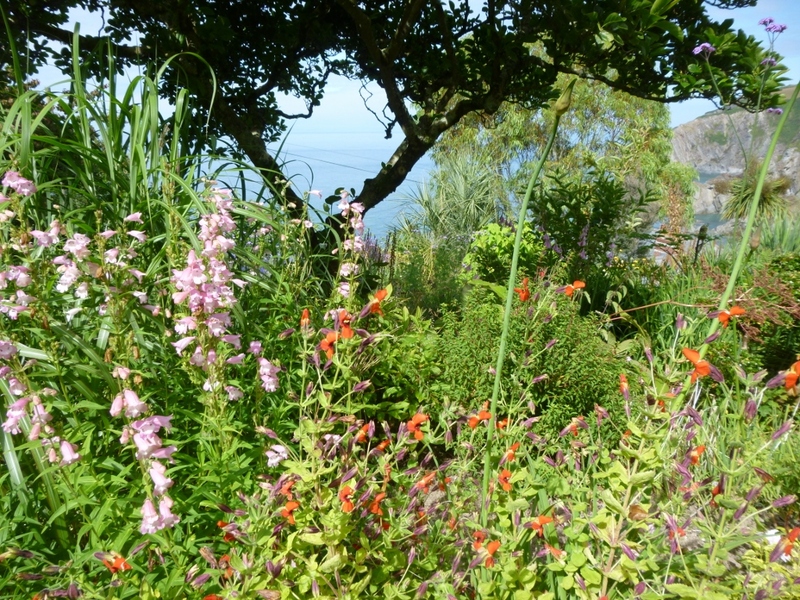 I have been away from the garden for ten days and things have moved apace in my absence. Some good, some bad. There has been a little rain but you would never guess on inspection of the soil/dust. There is a general air of dessication, the plants are looking little less than lush and this was not helped by the heavy heat of today. I am resisting watering anything but pots and the most needy, such as the newly planted and teacher’s pets. Hopefully the rest are pushing their roots are deeper as the days go by, delving into the moist layer that is bound to lie just a few inches below. Of course this is wishful thinking but I have to get to sleep at night somehow. 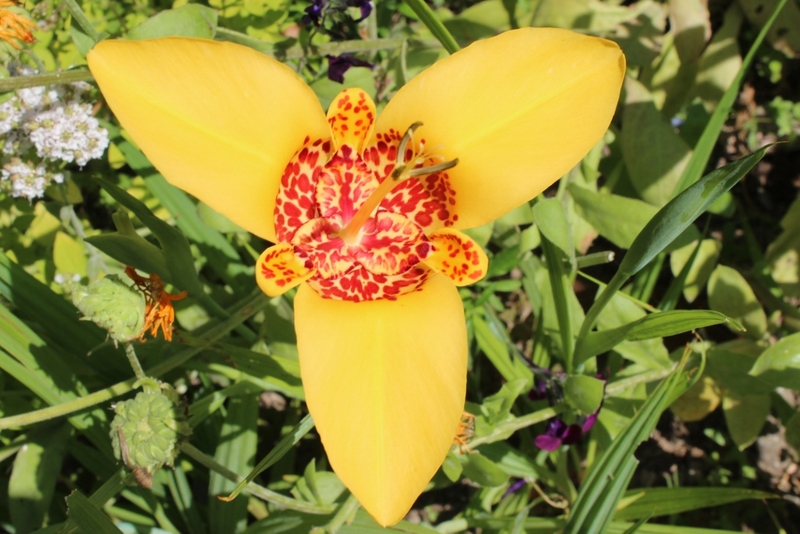 The jobometer has notably swung from planting out and potting on, to cutting back and dead-heading. Of course the weed thing hasn’t changed much, still popping up to taunt, it may be my imagination but even they looked a little gaunt and parched. All this warm weather has given Bambi an appetite, it appears that on the menu last week was a starter of Geranium psilostemon (how many Chelsea chops can this take I wonder?) a main course of Hydrangea quercifolia with a side order of geum and potentilla and to finish some fragrant sidalcea with a coreopsis garnish. However things have grown, fruit is ripening, flowers blooming. Time passes. They say a week in politics is a long time but in a garden ten days is even longer.